Born on April 11, 1827, Jyotirao Govindrao Phule fought social evils to make the society just and equal for everyone. It's because of his progressive thoughts and actions that girls in India today learn, work and has their own identity. 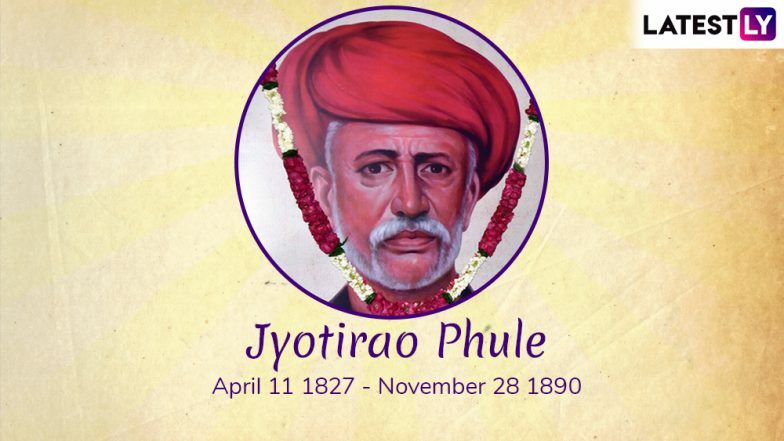 Jyotirao Phule Jayanti is observed in schools and colleges with different events where his works are discussed. He dedicated his entire life for the upliftment of women and the downtrodden. On his Jyotirao Phule's 192nd birth anniversary, we take a look at quotes, thoughts and sayings of the great mind. Jyotirao Phule - Social and Anti-Caste Activist. He worked extensively to implement widow re-marriage and championed for their acceptance in society. Mahatma Jyotirao Phule who was married to his wife Savitribai Phule at the age of 13 and grew up to also fight against child marriage. Born in a Mali caste of gardeners and vegetable farmers, after primary education he had to stop attending school and started working with his father to support his family. He later resumed his school in 1847. Phule is regarded as an important figure of the social reform movement and pioneer of women education in India. Savitribai Phule Jayanti 2019: Know The Contributions of India's First Lady Teacher. 1. The social reformer along with his wife started the first school for girls in 1848. They later also began schools for children from Dalit castes of Mahar and Mang. 2. He worked and abolished untouchability and caste system in Maharashtra. 3. Jyotirao and his brothers worked as florists for the Peshwas and hence they were called Phule as Phul means flowers in Marathi. 4. On May 11, 1888, he was bestowed with the title of Mahatma by a Maharashtrian social activist Vithalrao Krishnaji Vandekar. 5. In 1873, he formed Satya Shodhak Samaj (Seekers of Truth) with the aim of liberating bahujans and shudras (people belong to the lower caste) and protecting them from atrocities. It was even supported by Chhatrapati Shahu, the Maratha ruler of Kolhapur state. 6. Jyotirao wrote 16 books which contributed to the social awakening of the downtrodden masses who were constantly troubled by upper castes and Britishers. 7. Jyotirao Phule dedicated his book Gulamgiri (slavery) to the African American movement to end slavery. 8. He is credited with introducing the Marathi word 'Dalit' as they were treated out of the traditional caste system. 9. His wife Savitri Bai Phule who was also a social reformer is known as the first woman teacher of India and the first leader of the women liberation movement. 10. He opposed Brahminism and encouraged marriage ceremonies without any Brahmins leading the rituals. The turning point in Jyotirao's life came when he attended a Brahmin friend's wedding. His participation in the marriage procession received criticisms from his friend's parents. He was looked down upon and rebuked for doing as he belonged to a lower caste. This incident had a lasting impact on him following which he started actively worked on upliftment of people belonging to the lower castes. He died at the age of 63 on November 28, 1980, in Pune.